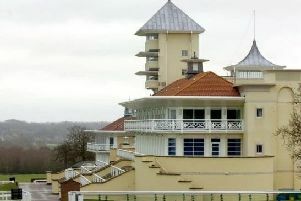 Heavy ground conditions and persistent rain meant punters were diving for cover at Towcester on a day when only the hardiest animals came up the hill. Stamina in abundance was the necessary requirement, and three of the winners had previously been successful on the course. That didn’t relate to opening scorer Phoeniciana but the Lucy Wadham-trained seven year-old, which had been mixing fences and hurdles of late, was twice placed at Towcester in 2016. Ridden by emerging French jockey Maxime Tissier who has now had eight winners from 23 mounts this season, an impressive strike rate by anyone’s standard, the 11/4 second favourite turned out a comfortable 18 length winner in the 2m Ladies Night At Towcester Racecourse Mares’ Maiden Hurdle. Similarly in decent form is Warwickshire trainer Robin Dickin whose nine year-old grey gelding Dontminddboys was an 11/4 favourite in the 3m handicap chase and ran out a two and a quarter length winner, chased home by Onurbike. Dontminddboys was ridden by Jack Quinlan who had been Dickin’s other 2017/18 Towcester winner Some Finish, back in November. After the Tom Symonds-trained Llantara (7/1) had won the 2m handicap hurdle in the hands of Ben Poste, sluicing up by 15 lengths from previous course winner Grams And Ounces, it was the turn of horses returning to the scene of past victories to shine. That meant Skipping On (15/8 fav) taking the 2m novices’ limited handicap chase in the hands of Patrick Cowley, Dr Des (4/5 fav) winning the 2m 3f novices’ hurdle and The Bay Birch (10/11 fav) scoring in the 2m 4f handicap chase. Laura Morgan’s Waltham On The Wolds team have been in red hot form of late with Morgan’s younger sister Kelly training 50/1 runner-up in the Fox Hunter’s Chase at the Cheltenham Festival. Skipping On won at Towcester at the beginning of February and made the most of a tardy start by two of his three rivals to win handsomely. Dr Des has been a tremendous flagbearer for Moreton Pinkney based owned Richard Whitehead this season and scored a third victory of the campaign, following up a Towcester win on his penultimate start. The Bay Birch runs for Matt Sheppard’s Ledbury stables and ran out a 27 length winner from the Alex Hales-trained Indian Native. The concluding bumper went to 5/2 favourite Captain Drake for harry Fry and jockey Michael Legg.